doors, and perhaps this is the only way I can have a taste of their fine food. but other heirloom varieties will do. Press wheels of well chilled goat cheese into the chopped pistachios, covering both sides. Place arugula into a small bowl and toss gently with the olive oil, juice of the lemon, balsamic vinegar, salt and pepper. 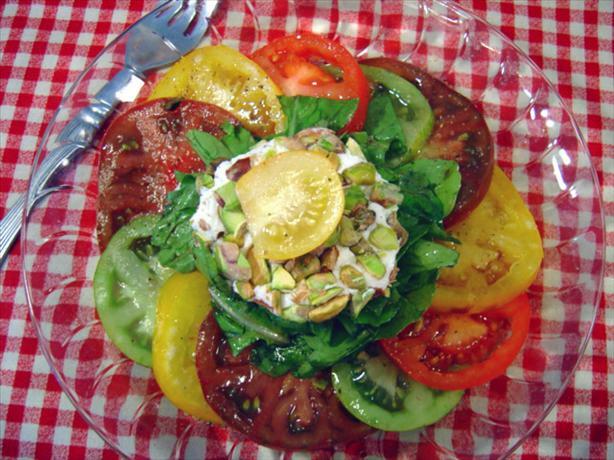 Top arugula with pistachio goat cheese, garnishing with sliced cherry tomatoes, if desired. Sure wish we were in tomato season in Australia. Looks divine.